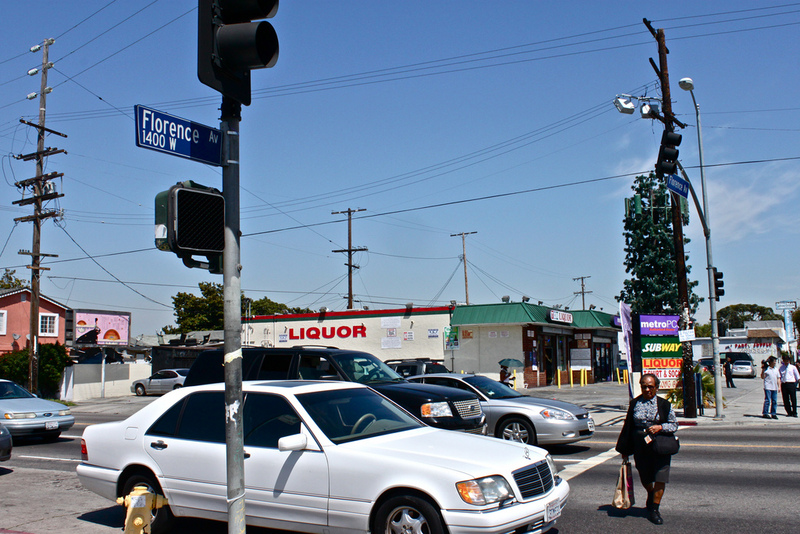 Each Friday afternoon, the corner of Western Avenue and 39th Street in South L.A. gets a little brighter. 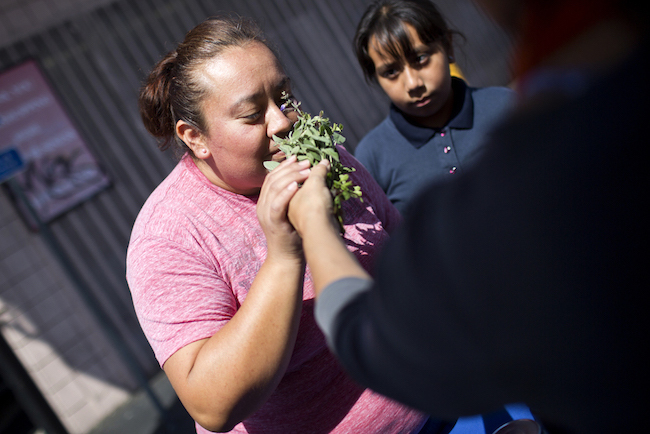 Just before 2 o’clock, Rosario Mireles pulls up in a utility truck, unloads crates of organic fruit and vegetables, and sets up a produce stand in the parking lot of a liquor store where addicts used to loiter. On West 48th Street in Hyde Park, a neighborhood of South L.A., children soak in the afternoon sun on swing sets and plastic slides at Angeles Mesa Park. Just down the street, amid residential streets lined with quiet houses, Kenny’s Market & Liquor stands covered in bright yellow paint, its luminescent ‘liquor’ sign inviting passersby to peek inside. 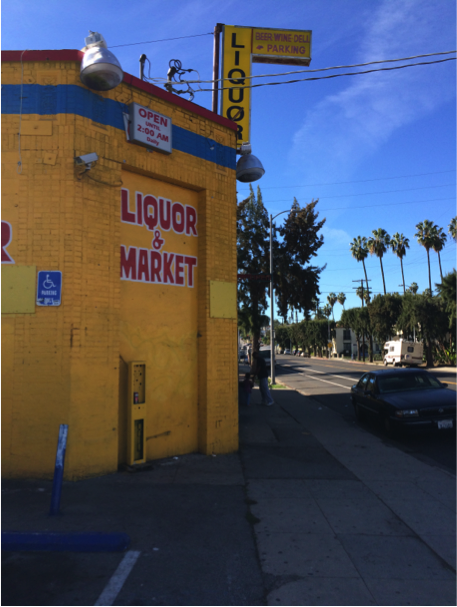 According to the 2012 “Health Atlas” compiled by city and county departments, Kenny’s Market & Liquor is just one of 152 establishments with an off-sale liquor license in South L.A.
A store stayed true to its new title of “Market” instead of “Liquor” by introducing fresh food options after years of pressure from the community. 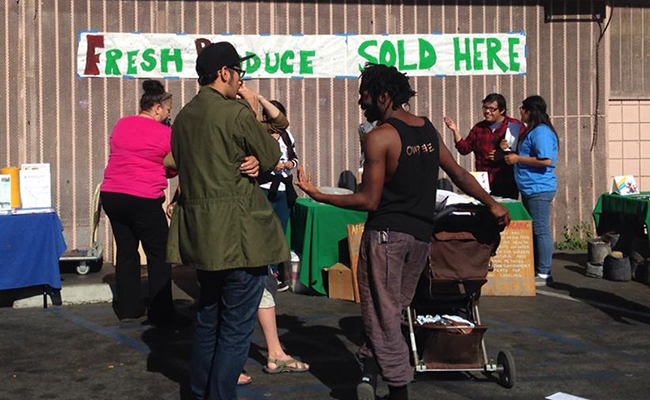 And with that, the number of stores offering fresh food options in South Los Angeles increased yet again. Century Market is the most recent liquor store in the area to commit to stocking its venue with fresh produce. The store located at Western and 39th streets opened in its new incarnation last weekend, debuting shelves with fresh fruits and other healthy food options. The idea was to prevent kids from seeing pictures glorifying tobacco when they were at school. 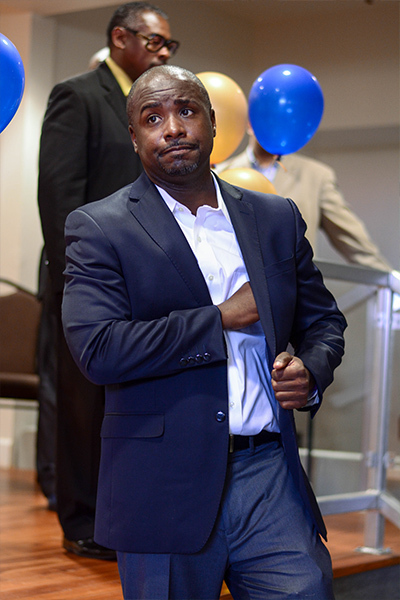 Marqueece Harris-Dawson was only just learning about the nuances of community organizing when his bosses told him to go to then assembly-member Herb Wesson’s office, and make the case to remove tobacco advertisements from public buses that are routed past schools. He entered Wesson’s office and gave his pitch. Wesson thought it was a great idea, and he soon delivered to the Metro Board a motion proposing all ads for tobacco products be banned from public buses. It passed. 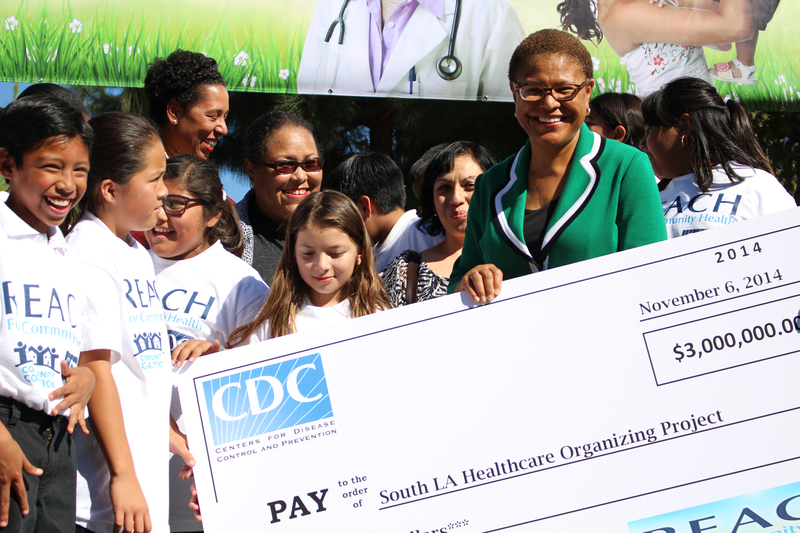 July 12 was a happy day for residents of the King Estates neighborhood in South L.A. Three weeks after the Ralphs supermarket on Western Avenue and Martin Luther King Jr. Boulevard closed, community members of the local nonprofit, Community Coalition and Community Services Unlimited opened “Fresh Fridays” Produce Stand so that neighbors would have a place to get fresh fruits and vegetables. 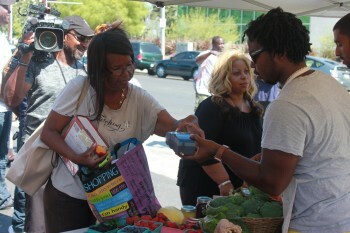 Creating an unlikely partnership with a local liquor store, community members of the local nonprofit, Community Coalition and Community Services Unlimited are opening “Fresh Fridays” Produce Stand on the corner of 39th Street and Western Avenue to sell fresh, organic fruits, vegetables and snacks. The grand opening of Fresh Fridays is this week on July 12 from 3-6 p.m. at 3894 S. WesternAvenue, in the parking lot of Century Market, a liquor store that just three years ago was the target of a large community protest by residents for being a public nuisance. The liquor store, which has since worked to maintain community standards and city ordinances, has agreed to host the produce stand every Friday. “This effort speaks to the power of what can happen when everybody comes together – neighbors, business owners, local non-profits – to build a better community for everyone,” said Marqueece Harris-Dawson, President & CEO of Community Coalition, which has been leading an effort to reduce crime and violence. The produce stand in the King Estates neighborhood is part of a larger movement in the area to build a healthier and safer community. 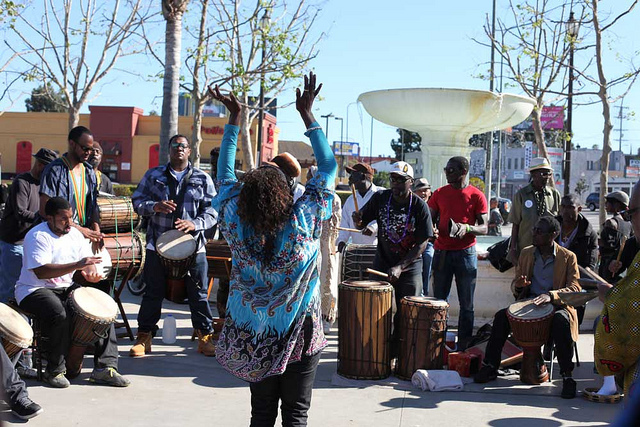 Over the past several years, Community Coalition has helped residents secure over $1 million in public funding to turnaround Martin Luther King park located across the street from the liquor store and to improve public health and safety by bringing in programs like the city’s anti-gang program Summer Night Lights. “This produce stand represents another step in the right direction towards transforming our community and bringing better, healthier and safer opportunities for our families,” said Dorothy Redmond, a long time resident and mother of three. The stand will sell organic and locally grown fruits and vegetables, conduct cooking demonstrations, and give out free samples. 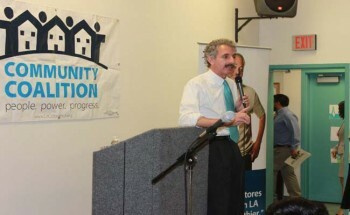 Fresh Fridays start on July 12, 3-6 p.m. at 3894 S. Western Ave.
City Attorney Mike Feuer speaking at a South L.A. meeting. Many Americans will remember June 20 as the night when LeBron James, Dwyane Wade, Chris Bosh and company won their second consecutive NBA championship. 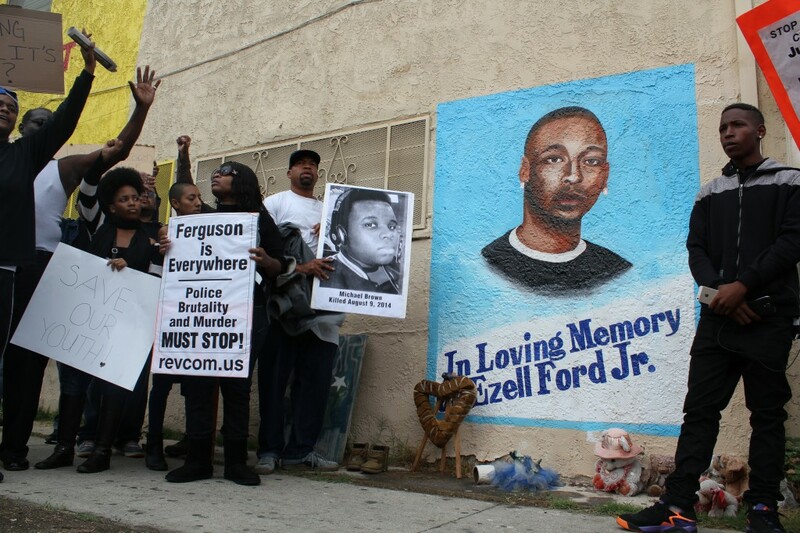 South Los Angeles hopes to remember this date as a symbolic moment, in which a new and productive relationship was developed with the city attorney`s office. Last night, over 100 South L.A. residents attended a town hall meeting organized by Community Coalition at its South L.A. headquarters, to meet the newly elected Los Angeles City Attorney, Mike Feuer. The high level of energy and the eagerness to let Mr. Feuer better understand their issues and concerns clearly demonstrated that residents are hoping that the new city attorney –who will take office on July 1– will help to improve their community’s quality of life. The long, exhausting and grueling presidential campaign is finally over. Barack Obama has been re-elected and his supporters woke up this morning feeling happy, relieved and at ease. 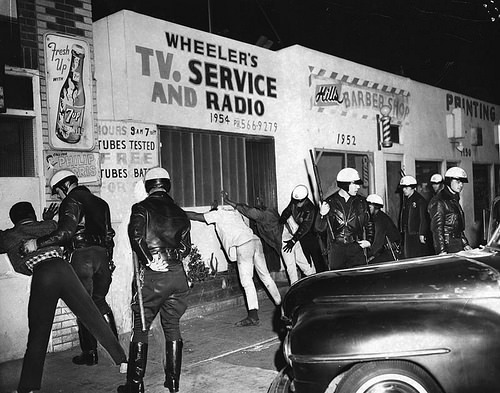 Last night, emotions weren´t as peaceful among some President Obama supporters. In an electoral viewing party held by Community Coalition, South LA neighbors came together to watch CNN’s coverage of the election. “How are they doing?” These were the first words asked by a woman arriving to the party with her teenage daughter at 6:50 p.m.
“It´s tight,” was the response she received. She wasn´t the only one feeling that way. There was a tense atmosphere among the people watching the coverage at Community Coalition´s headquarters. At 7:00 pm, a number of people cheer when they hear that CNN has projected President Obama´s victory in New Hampshire. 15 minutes later, CNN reporters say that Democrats hold onto Senate majority. The mood is beginning to change. People are starting to loosen up and some are even making a couple of jokes. Others decide to stand up and begin eating the food offered by Community Coalition. At 7:44 pm, people begin cheering when CNN projects that President Obama has won Minnesota. 11 minutes later clapping sounds fill the room as they find out that Democrat Elizabeth Warren defeated incumbent Republican Scott Brown in the Massachusetts Senate race. At 8:00 pm, a large cheer is heard as the community learns that Obama has won California, the biggest and most populous prize of the night, which carries with it a whopping 55 electoral votes. Only five minutes later, the loud joviality turns into silence when CNN projects that Mitt Romney has won North Carolina. 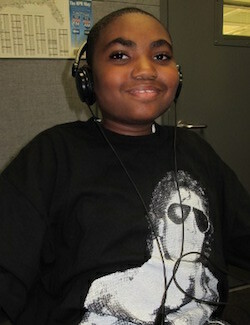 Jocelyn, Mirna’s 11-year-old daughter who studies at the Ambassador School of Global Leadership, doesn´t care who wins. “Why is everyone so nervous about this?” she asked. As these words came out of her mouth the room was filled with cheering, yelling and cries of happiness. It was 8:15 and CNN informed that President Obama had won the elections. “Everybody´s going crazy,” Jocelyn said, as she observed the members of her community. “You have to write that down in your article,” she added.